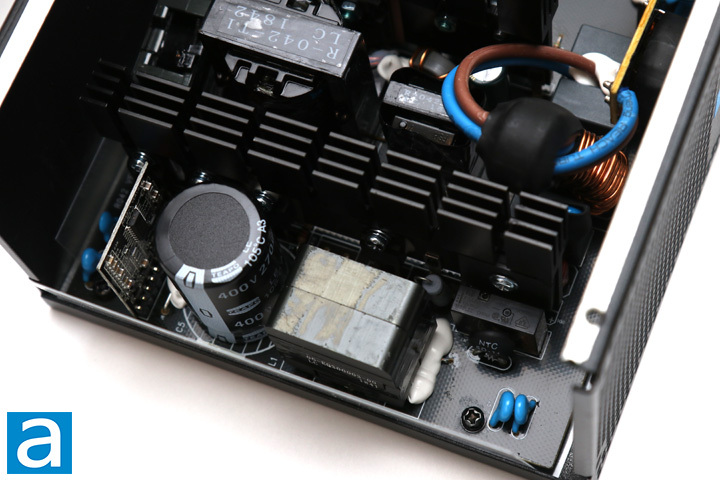 As expected, we opened up the Seasonic S12III 500W power supply to take a closer look at what is going on inside. Opening up this power supply will void your five year warranty, as the warranty seal covers one of the chassis screws. For your benefit, we voided our warranty on this unit, so you do not need to. There are zero user serviceable parts inside anyway. Removing the top shell is easy as it requires four screws to be removed; one at each corner on the side. Afterwards, you can slide apart the top and bottom shells to get inside. The OEM for the Seasonic S12III 500W is Shenzhen Ruishengyuan Technology, which is actually surprising. Most of Seasonic units are made by them, so it will be interesting to see what we have today. The photo above shows an overhead view of its internal components. Build quality from a construction stance is pretty good with only a few globs of glue to keep the parts in place. 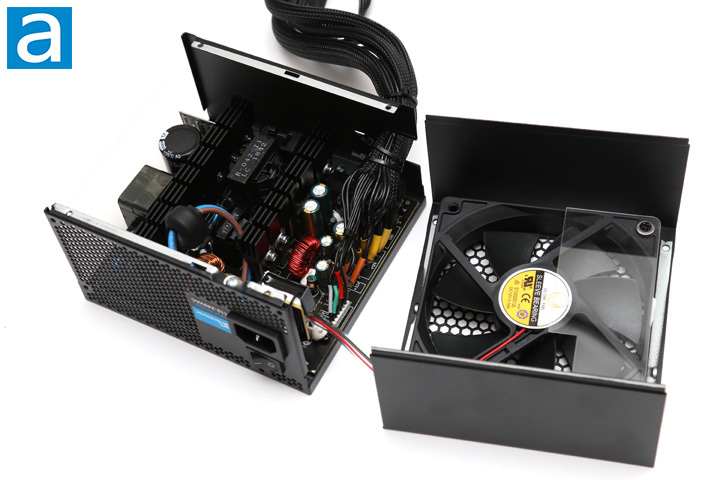 Otherwise, there are two large heatsinks painted in a black cover to match the darker interior. 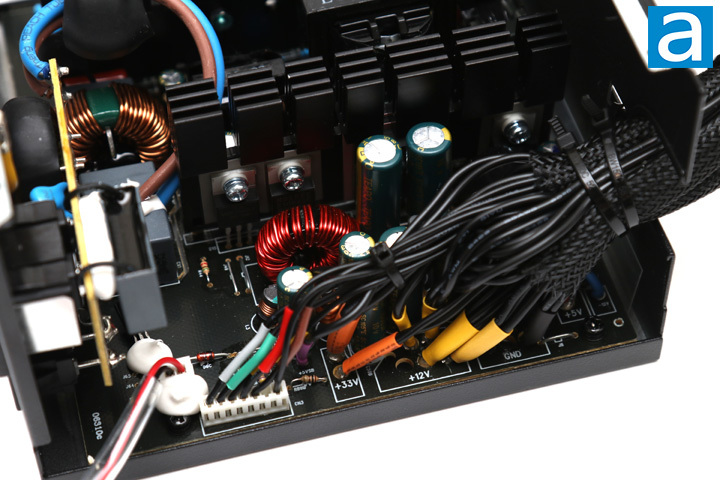 The transient filter stage is the first input stage of any computer power supply, so we will take a closer look at this first. From here, there are two ferrite coils and a metal-oxide varistor. A single X-capacitor and two Y-capacitors are placed at the AC receptacle, while another three X-capacitor and two Y-capacitors are found on the main board. In total, this is at least twice the required X- and Y-capacitors recommended, which is good to see. On the primary side, there is a single Teapo capacitor rated at 270uF at 400V. It has a temperature rating of 105c. While Teapo is a better known brand for Taiwanese capacitors, it would have been more affirming to see a Japanese main capacitor here like Nippon-Chemi Con or Rubycon. On the other hand, budget power supplies often have primary capacitors rated at a lower 85c temperature and thankfully this at least keeps the higher temperature rating. Most of the secondary capacitors around this board are also Teapo branded capacitors. The power supply uses one GBU806 rectifying bridge. This supports up to 8A of current at 100C. At 115V, the theoretical power you can pull from the bridge rectifier is 920W at 100% efficiency. Of course, this is purely from the bridge rectifier, and not all components in the power supply can actually hold this workload. Even so, this is well above the necessary requirements for a 500W power supply. 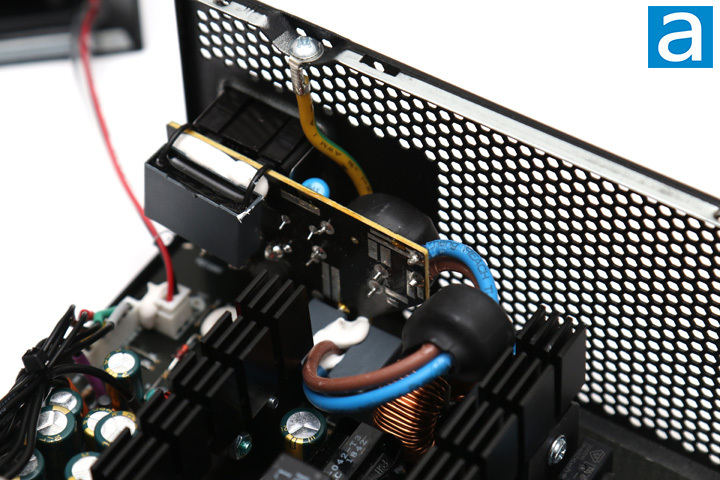 The active PFC circuit in the Seasonic S12III 500W is located on the first black heatsink near the primary capacitor. The active PFC circuitry is handled by two Oriental Semiconductor OSG55R290F. This transistor is rated to deliver 15A at 100 degrees Celsius continuously, with a maximum resistance of 0.29 ohm and a typical resistance of 0.26 ohm. A single Champion GP28S50G MOSFET can also be found with a drain to source voltage of 500V, continuous drain current of 28A at 150 degrees Celsius continuously with a maximum resistance of 0.125 ohm. These on characteristics are called Static Drain-Source On-Resistance or commonly abbreviated as RDS(on). The more efficient the component is, the lower the RDS(on) value, since it wastes less power with lower resistance. A single STMElectronics STTH8R06D boost diode is also found in the active PFC circuitry. As for the secondary side, there are quite a few more Taiwanese capacitors made from Teapo for both the electrolytic and polymer capacitors. The electrolytic capacitors are all rated at 105c. Unlike modern high efficiency power supplies, this uses a LLC resonant converter design with the +12V and +5V rails regulated together, and +3.3V generated separately. As such, the secondary side shows some various components. On the second heatsink, we can first find two MOSPEC S40D45CL attached to a large metal heatsink with a MOSPEC S30M45C beside it. A MBR1060CT Shottky rectifier can also be found in the secondary circuitry. Finally, an Excelliance EM8564A PWM controller can be found around here. The Seasonic S12III 500W does provide protection for OPP, OVP, UVP, and SCP, but oddly enough, there is no OTP or OCP, which are over-temperature or over-current protection. The datasheets for all components mentioned in this review can be found on their respective manufacturers' websites. Finally, you can see where all the cables are connected and sleeved to lead outside of the Seasonic S12III 500W. There is nothing too special here, other than the fact there are a lot of cables running around here. Overall build quality is pretty good for a budget power supply, though you can see where Seasonic cut corners when they are not the OEM. Component selection is on the lower tier of parts, but they should work fine within the warranty period. In addition, this design is a bit outdated compared to the more efficient DC to DC topography we are used to seeing in more recent power supplies. Some parts are pretty close together, but the large heatsinks and relatively open layout should help in this regard. 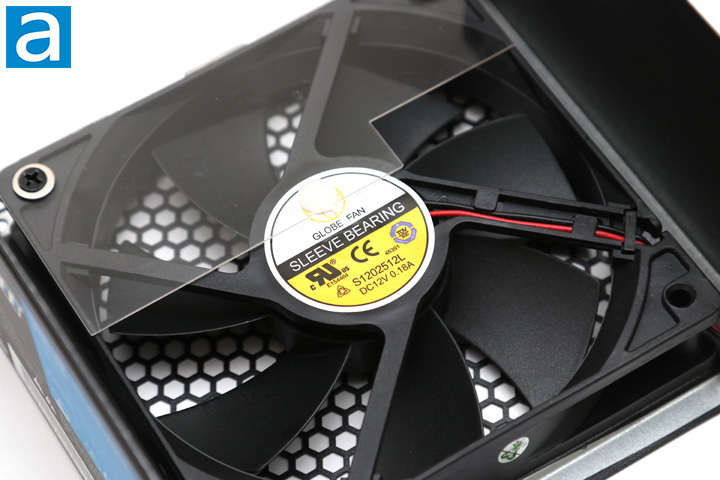 As for cooling, a single 120mm Globe Fan Sleeve Bearing S1202512L is provided, connected to the mainboard of the power supply. 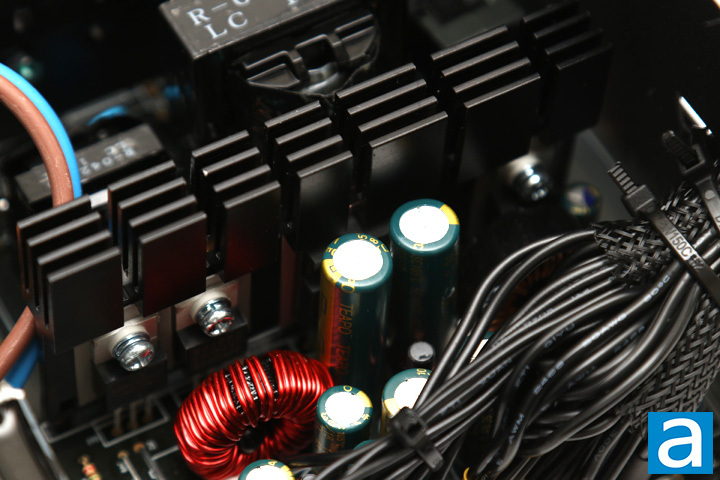 A sleeve bearing is relatively common for power supplies. Further research reveals the fan operates at 12V and 0.18A. This rotates at a maximum 2000RPM. The rated air volume is 50 CFM at a noise level of 34 dBA. posted 3 hours and 29 minutes ago, with 2 posts. posted 3 hours and 34 minutes ago, with 59 posts.